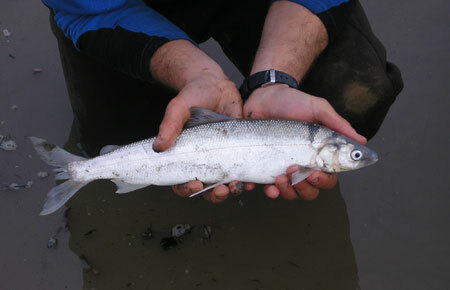 Arctic cisco have the highest tolerance for saltwater than any other whitefish. Arctic cisco have a metallic silver body with a brown to dark green back; pale, almost colorless fins, and no spots. They have no teeth on their jaws, but have a patch of teeth on their tongue. Arctic cisco may reach 508 millimeters (20 inches) in length and can weigh up to one kilogram (~two pounds). The Arctic cisco is a member of the whitefish family and is anadromous, meaning it spawns in freshwater, but can feed and overwinter in saltwater. Unlike Pacific salmon, Arctic cisco can live to spawn several times. Arctic cisco can spawn (reproduce) at eight or nine years of age and can live to be 13 years or more. Females may not produce eggs every year and may only spawn two or three times in their lifetime. Arctic cisco spawn in Canada's Mackenzie River in September, but do not reproduce in Alaskan waters. After hatching, the young fish migrate west along the Beaufort Sea coast. Easterly winds help "push" the young fish to the Colville River delta west of the Canadian Border; more than 160 kilometers (100 miles) from where they began. Arctic cisco remain in the Colville River area until they are sexually mature, at which time they migrate back to the Mackenzie River to spawn. Adult Arctic cisco eat crustaceans (crabs, shrimp, krill) and small fishes. The feeding habits of juvenile Arctic cisco are unknown. Arctic cisco are in the Beaufort Sea and in the lower reaches of the Colville River, and freshwater drainages east of the Sagavanirktok River. They do not commonly occur east of Point Barrow. They also live in several drainages in the Northwest Territories and Siberia. We know very little about the abundance and production of Arctic cisco in Alaska, but past commercial and subsistence harvests (as much as 80,000 fish per year) appear to be sustainable. 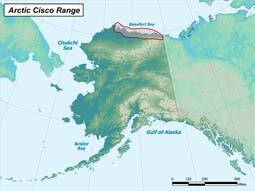 We believe that the recruitment and production of Arctic cisco in Alaska are largely affected by wind-driven currents. Juvenile Arctic cisco need enough current [greater than 5 kilometers per hour (3 miles per hour)] to help them move to productive rearing areas in Alaskan waters. The two biggest threats to the Arctic cisco are climate change and oil and gas development. As the climate warms in the Arctic, factors important to Arctic cisco survival may change. These factors include strength and persistence of easterly winds, sea level, storm frequency, and water temperature. In addition, the construction of a 1,200 kilometer (745 mile) pipeline on the Beaufort Sea may affect Arctic cisco reproduction, growth, and survival. The Mackenzie Gas Pipeline, will begin near the river delta and run underground along the east side of the river. The Canadian Department of Fisheries and Oceans is collecting data to be used to avoid or lessen any ill effects on fish and wildlife from the pipeline construction and operation. Arctic cisco do not spawn in Alaska. Arctic cisco occur in lakes in Russia and Ireland. The Inupiat name for Arctic cisco is “Qaaqtaq”. The Arctic cisco is the most important commercial and subsistence fish species for people of the North Slope villages. ADF&G is not currently conducting any research on Arctic cisco. The Canadian Department of Fisheries and Oceans and consulting groups in Alaska have researched the movement of fish between the Mackenzie and the Colville rivers.